Looking for more epic monster movies like Kong: Skull Island? We’re sharing our picks for five great flicks to watch while you’re waiting for the march 10th release! The movie is a reboot of the King Kong movie franchise which began with the 1933 King Kong. If you checked out our Kong trivia, you know that Skull Island is the 2nd movie in Legendary Entertainment’s MonsterVerse, with the 2014 Godzilla being the 1st. Here are 5 movies like Kong: Skull Island for you to check out. King Kong is a 2005 epic monster adventure movie that is a remake of the 1933 movie of the same name. The movie showcases the tale of King Kong, a legendary gigantic gorilla, who is captured and put on display, with disastrous results. King Kong stars Jack Black as Carl Denham, Naomi Watts as Ann Darrow, Andy Serkis as the voice of King Kong and Adrien Body as Jack Driscoll. Cloverfield is a 2008 found-footage monster horror movie that is the 1st in a series of 3 Cloverfield movies, with the 2nd being the 2016 movie 10 Cloverfield Lane and the upcoming 2017 movie God Particle. The movie focuses on a group of six New York residents, Robert Hawkins, Hudson Platt, Lily Ford, Elizabeth McIntyre, Marlena Diamond and Jason Hawkins, who flee the city after a gigantic monster terrorizes the city. Cloverfield stars Michael Stahl-David as Robert, TJ Miller as Hudson, Jessica Lucas as Lily, Odette Annable as Elizabeth, Lizzy Caplan as Marlena and Mike Vogel as Jason. Monsters is a 2010 science fiction monster movie. The movie is set several years after a NASA crash probe in Mexico, leading to the appearance of huge tentacle monsters. Monsters stars Scoot McNairy as Andrew Kaulder and Whitney Able as Samantha Wynden. Godzilla is a 2014 epic science fiction monster movie that is the 1st movie in Legendary Entertainment’s MonsterVerse movie franchise, with the 2nd, of course, being the 2017 Kong: Skull Island. The movie tells the story of Godzilla, a monstrous creature that may be responsible for saving the human race. Godzilla stars Aaron Taylor-Johnson as Ford Brody, Ken Watanabe as Dr. Ishiro Serizawa, Bryan Cranston as Joseph Brody, Elizabeth Olsen as Elle Brody and Juliette Binoche as Sandra Brody. Jurassic World is a 2015 science fiction adventure movie that is the 4th movie in the Jurassic Pack film franchise. The 1st movie in the franchise is the 1993 Jurassic Park, the 2nd is the 1997 The Lost World: Jurassic Park and the 3rd is the 2001 Jurassic Park III. The movie focuses on the island of Isla Nublar, where Jurassic Park, a popular theme park, is built. One of the genetically created dinosaurs from the park gets loose in the park and sets out on a rampage. Jurassic World stars Chris Pratt as Owen Grady, Bryce Dallas Howard as Claire Dearing, BD Wong as Dr. Henry Wu and Vincent D’Onofrio as Vic Hoskins. These are just a few of our favorite monster movies like Kong: Skull Island. Of course, you could also have a movie marathon night with all the differen versions of King Kong that have been made over the years! Got another flick to add to the list? 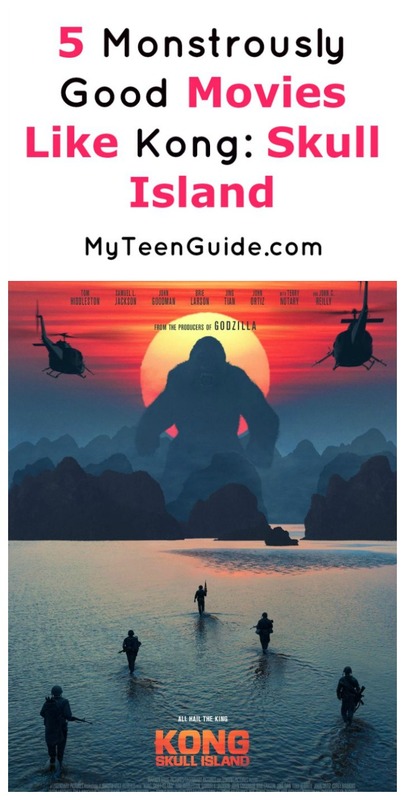 Tell us your favorite movies like Kong: Skull Island in the comments!